Rehydrate carrots and broccoli in 4 cups water, if using. Let sit 20 minutes. Mix 2 ½ cups water with beef bouillon, chili powder, vinegar, salt, garlic powder and pepper in a large frying pan and bring to a boil. Measure in TVP, stir immediately to distribute liquid and then cover. Let sit for 10 minutes. Mix in rehydrated vegetables. Add tomato sauce and paste and mustard. Stir to incorporate. Warm through and serve. Categories: Cooking with Food Storage, October 2015 | Permalink. Salt has been used as a food preservative for thousands of years. In the absence of refrigeration, it is a low-cost and quite reliable method of preventing the growth of fungus and unfriendly bacteria while cultivating the same gut-friendly lactobacilli present in live-culture yogurt. Although this recipe is for cucumbers, you may substitute other fresh, unwaxed vegetables such as zucchini, peppers, green beans or baby eggplants. Wash and trim cucumber ends. Cut into slices or chunks if they are a larger, non-pickling variety. Place herbs, spices and leaves in the bottom of a very clean ½ gallon jar and then add cucumbers. Thoroughly dissolve salt in 1 quart of water and pour into jar, covering cucumbers by at least 2”. Keep cucumbers under the brine by filling a smaller jar or partly filling a clean Ziploc bag with brine and putting it inside the larger jar directly atop the cucumbers. Cap the jar and let it sit between 65F-85F for about ten days. Remove any scum or mold that form on the surface—as long as the cucumbers have remained submerged, it will not affect them. As you approach the seven-day mark, watch for a decrease in the bubbling or for the pickles to seem to “fall” lower in the jar as these may be signs that the fermentation is complete. The jar should smell pleasantly sour when opened. If it smells rotten or appears slimy or spoiled, throw it out and clean the jar thoroughly before trying again. If all is well, remove your submerging device, refrigerate (or store under 65F) and enjoy! Categories: Cooking with Food Storage, September 2015 | Permalink. Preheat oven to 350F. In separate bowls, rehydrate ground beef and vegetables by soaking in water until soft, then drain excess water. In a large bowl, combine all ingredients and mix together until well-blended. Place mixture in a greased 9×13 bread pan and shape into a loaf. Drizzle some extra tomato sauce on top, and cook for 70 minutes. Categories: August 2015, Cooking with Food Storage | Permalink. Open-fire cooking is the way that most food has been cooked through the history of the world, but today many of us could go through life without doing much more than roasting a marshmallow or a hot dog. 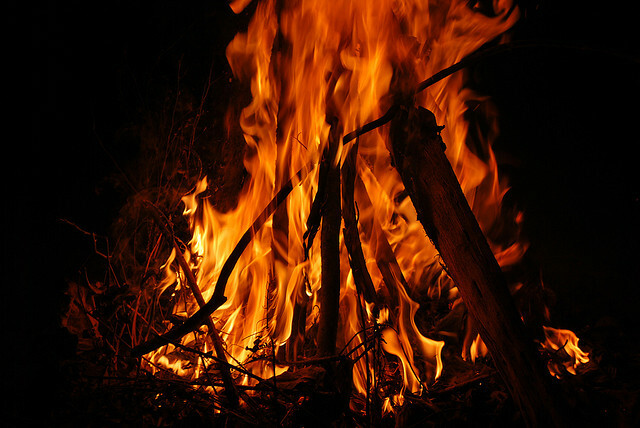 As we are unlikely to do well in an emergency eating a diet of s’mores and hot dogs, it would be well to spend a little time becoming familiar with some basic techniques of open-fire cooking. Never rest a pan on burning wood. As the wood burns it will destabilize your pan and flame heat is notoriously uneven and erratic. Foods with a good deal of liquid to even out cooking temperatures can be boiled over flames if you set up a grate or other support (a tripod or stacks of bricks on either side will work). Solid foods may be cooked on sticks in the flames, but realize that they will likely be seared—browned on the outside, while potentially still raw on the inside—so reserve this technique for foods that cook very quickly or do not need thorough cooking for safety. For everything else, let the fire burn to a nice bed of coals. These will provide steady, even heat and you can even adjust the temperature somewhat by raking them together to concentrate heat or by spreading them out for slower cooking. Coals are perfect for tin foil dinners, bean-hole beans and dutch oven cooking and can also be used for spit or string roasting (click here for instructions on this old-fashioned technique). You can estimate temperature without a thermometer. Place your hand in the area where you are planning to place your food for cooking and (without touching anything solid, of course) see how long you can hold your hand there. The formula as 50 degrees Fahrenheit per second, like this: 1 second=over 500F, 2 seconds=500F, 3 seconds=450F, 4 seconds=400F, 5 seconds=350F, 6 seconds=300F, etc. Many of these techniques will adapt to indoor cooking in your fireplace. While most fireplaces are inefficient heat sources, being able to cook safely indoors during an emergency could be a lifesaver. For more information on fireplace cooking, click here. Categories: Cooking with Food Storage, July 2015 | Permalink. There are two things kids love to do when it comes to food. First, they love to choose what they get to eat. Second, they love to eat food that they cook outside. Tin foil dinners are a great way to do both. There are many recipes out there. I’ll share one here as an example. Feel free to experiment by adding sausages, vegetables, spices, etc, to your heart’s content. First, a clarification—nobody makes tin foil dinners with tin foil anymore. Use heavy duty aluminum foil. Tear a piece of heavy duty aluminum foil that is about 12 inches long. Lay it on a table or counter and grease it with oil, butter, or a spray. Put ¼ lb ground beef, 1 chopped potato, 1 chopped carrot, and ¼ chopped onion in a row 3-4” thick in the center of the foil. Add salt, pepper, and any other spices to taste. Fold the sides to create a pouch that is completely closed and well-sealed. Make sure that it has room to expand. Think of a small version of jiffy pop. The foil pouch will expand as the liquids inside steam. Put the tin foil dinner on mature coals, meaning there are no flames coming from the coals. If you put it on flames, it’s likely to get burned. Flip over after about 10 minutes and remove from the fire at about 20. Coal temperatures can vary a lot so this will take some trial and error. Maybe make a couple of extra so you can have a test case or two while you determine the right timing. You don’t have to wait for a campfire to try tin foil dinners. You can cook them in a barbeque or even in the oven (just place in a pan with the oven at 425 degrees). Some of the best results come from putting a variety of ingredients out and letting people create their own tin foil dinner. For more ideas, search the internet for “tin foil dinner recipes.” Have fun! Categories: Cooking with Food Storage, June 2015 | Permalink. Rehydrate celery and onion for 20 minutes and then drain. Saute briefly in butter or oil until tender. Whisk in flour and let bubble over medium low heat for 3 minutes. Add stock and cook till thickened, stirring constantly. Add remaining ingredients and heat thoroughly. Categories: Cooking with Food Storage, May 2015 | Permalink.